We have all experienced times in our lives when we have been so eager to do something new that we jumped in a little sooner than we were ready. This is especially true for kids. My five year old is the youngest of three sisters and she is so determined to do the same things as her older sisters. If her sisters climb a wall at the playground or make it across the monkey bars, she wants to do the same thing. She isn’t always strong enough or big enough to achieve the same physical feats as her sisters. Every kid wants to be able to do things they aren’t yet ready to do or haven’t yet learned how to do. Every parent who has run alongside their child while teaching them to ride a bike have lived this experience. In Benjamin Birdie’s First Flight and the sequel Benjamin Birdie and the Tree Dwellers Benjamin Birdie shows this same desire to get moving and push his limits. 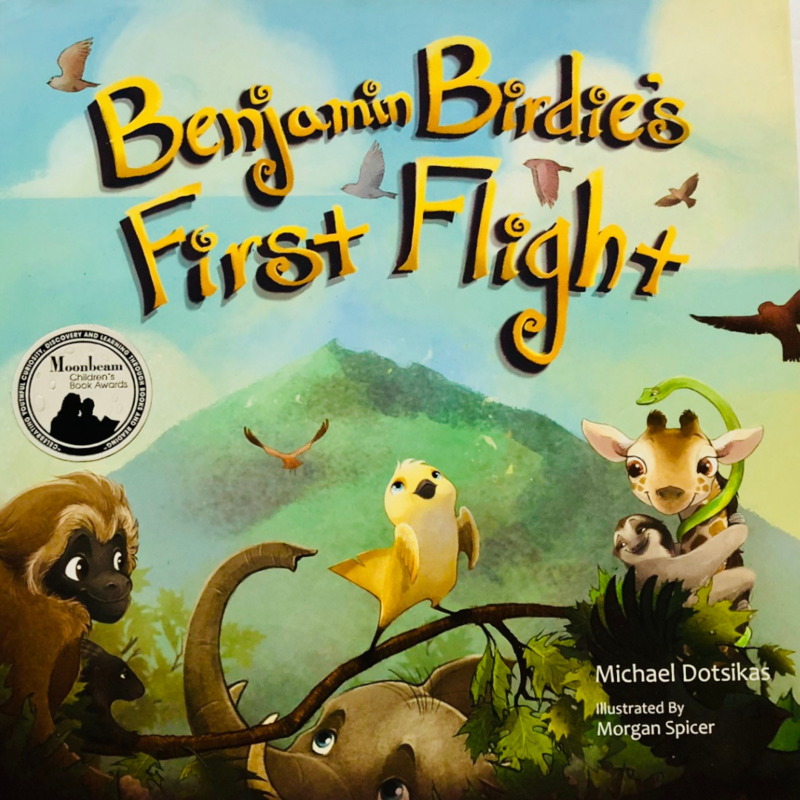 Benjamin Birdie is written by Michael Dotsikas and illustrated by Morgan Spicer. Benjamin Birdie is (as you might have guessed) a little bird who has not yet learned to fly. One day his mother heads out to grab lunch and in spite of her telling him that he isn’t ready to fly, he decides to jump in with both wings and give flying a try while his mum is out. He discovers that flying isn’t as easy as he thought it might be. Fortunately he has some friends in the tree who catch him on the way down and help him get back up before his mum gets back home to the nest. In the second book Benjamin Birdie’s mother encourages him to try flying now that he is older and stronger. Of course he is pretty nervous given his previous experience of falling out of the sky. This time his friends encourage him and he recovers his confidence and he takes off into the sky. His friends learn from his example, face their own fears and try out something they have always wanted to do. We’ve had both of these books for a couple of months and have read them to our five year old. She now she regularly asks to have one of them read to her at bedtime. She enjoys both the story and the beautiful illustrations of the animals and their homes in the tree. Both books also have sections at the back with information about the animals featured in the book. You wouldn’t find most of the animals in the same habitat in the wild. That doesn’t really matter in this case. They are all cool looking or interesting animals that help to keep her attention and sometimes my daughter just skips the story and asks me to read the section at the back about each of the animals. We have a lot of books in our house and staying power is important. We don’t need books lying around that nobody reads and we regularly have to get our kids to cull books from their shelves to make room on their shelves for all the books we keep. The Benjamin Birdie books have already survived one cull and my daughter still keeps them beside her bed for easy access. I would definitely recommend these books for any kids who like animals and a good story. I’m not sure if reading these books has helped my daughter overcome any fears about trying anything new, but she is generally pretty fearless so it is hard to know for sure. I received one copy of each of these books to review and received no other compensation for this review. All opinions are my own.